In the immediate days following their return to Vienna, the two brothers began to pick up the pieces of their former lives. My uncle managed to return to business, had some success, married a survivor of the camps, Celia Bartfeld. Eventually, they moved to Canada, where he raised his two children, Fred and Benita, and became a successful real estate developer and active member of the Jewish community in Toronto. In Vienna, someone had heard of my father’s work as a chemist and suggested they go into business together. My father, having committed his life to the Jewish people, declined; he needed to serve the She’rit Hapleitah, the Surviving Remnants. 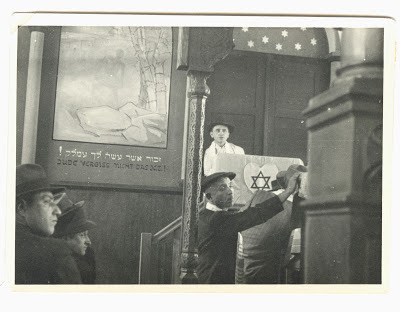 He began some piecemeal work and started writing in local Jewish publications. My uncle had a practice of frequenting the Rothschild Hospital, the gathering point for Jewish refugees now flooding in from territories under Soviet occupation, in hopes of finding lost relatives and friends. One day, he came back to the apartment he shared with my father,” I have a surprise for you!”. He had found Irene, the daughter of their cousin, Norbert Gottdenker, from Lwow, Poland (by now, Lviv, Ukraine)! The surprise would eventually become my father’s wife and my mother. By 1947, my father went to the Displaced Person Camp at Hallein( near Mozart’s Salzburg), Austria, where he was charged with establishing a “People’s University” where the survivors, denied of education while in the Concentration Camps could now learn real life skills for their new life in freedom. Then, in 1948, he was called to serve as the first Landesrabbiner ( State Rabbi) of Hesse, the region of Germany surrounding Frankfurt Am Main and it was there that I was born. In that capacity he worked to bring together the surviving remnants of old Frankfurt Jewry with the new arrivals from East Europe. He represented the Jewish community to the American government now occupying the region, the Frankfurt and Hesse government officials, and the newly forming democratic government of West Germany. 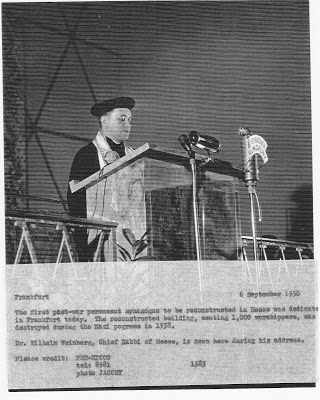 He officiated at the rededication of the main synagogue of Frankfurt in 1951. He had to struggle with active anti-Semitism and unrepentant Nazis who still hoped to finish off Hitler’s work and saw my father as their enemy. The first post-war permanent synagogue to be dedicated in Hesse was dedicated in Frankfurt today. The reconstructed building, seating 1,000 worshippers, was destroyed during the Nazi pogrom in 1938. 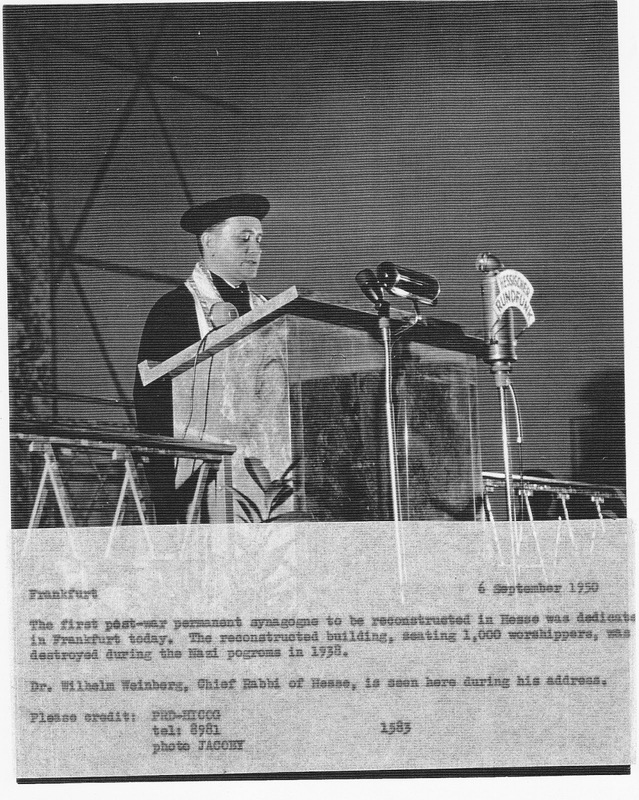 Dr. Wilhelm Weinberg, Chief rabbi of Hesse, is seen here during his address. ( HICOG- Allied High Commission for Occupied Germany). In 1951,we moved to the United States of America , the land my father admired and loved for its free and stable democracy. My father served the Jewish people to his last day, March 16,1976, the day of “ Shushan Purim”, the day Jews of ancient Susa and modern Jerusalem celebrate the triumph of the Jewish people over threatened genocide. This completes the first part of the account of Rabbi Dr. Wilhelm ( William in America) Weinberg. This work will continue with the account of Irene Weinberg, her youth in the new Republic of Poland, her survival in Aryan disguise during the Holocaust and her escape to freedom. The final volume of this project will focus on the reconstruction of Jewish lives in Austria and Germany in the aftermath of the Holocaust. This trilogy will represent the triumph of survival of the Jewish people in the years that followed the nightmare of Genocide, a triumph of Geist ( Spirit), the realm of heart, soul and mind and the sanctity of the human being in the Divine Image over the “ Triumph of the Will”, of the Will of a fictional Übermensch or Master Race or a Dictatorship of the Proletariat.